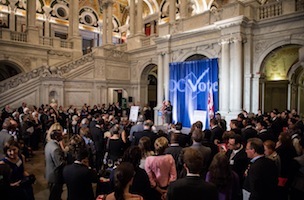 Last night in the Thomas Jefferson Building at the Library of Congress, DC Vote hosted its annual Champions of Democracy Awards Gala. The evening honored the Herb Block Foundation, founded in memory of 40 year Washington Post political cartoonist Herb Block, with the 2014 Champions of Democracy award, presented by Chicago Tribune editorial board member Clarence Page. Herb Block Foundation CEO and president Marcela Brane accepted the award on behalf of the foundation and introduced Herb Block scholarship recipient Oluwafemi Morrisey, who shared how the scholarship he received in honor of Block enabled him to pursue education at the University of the District of Columbia. Remarks were also offered by co-chairs Marie Johns, former president and CEO of Verizon, Washington, DC, and Barclays Wealth and Investment Management director Joseph Perta. “The Champions of Democracy Awards is an annual reunion for the DC Voting rights community to acknowledge the extraordinary efforts made on behalf of democracy, and then collectively re-energize to continue fighting for the democratic equality we so very much deserve,” Perry shared in her remarks. 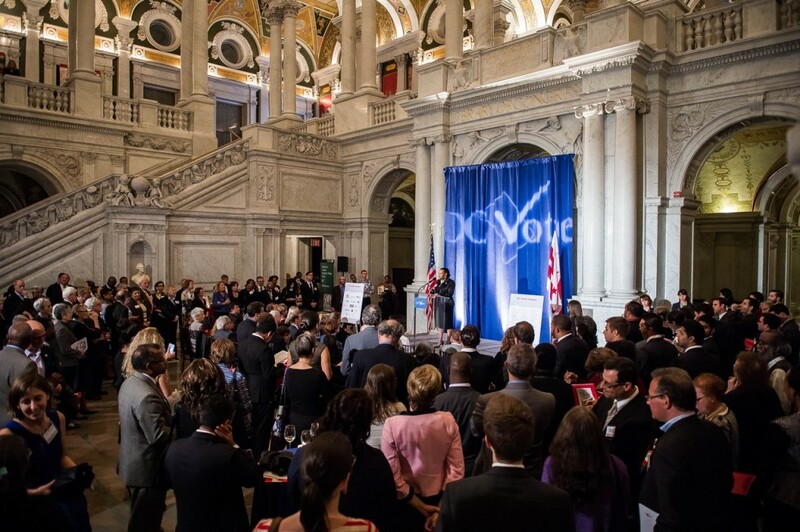 Rep. Eleanor Holmes Norton (D-DC) and DC council members and mayoral hopefuls Muriel Bowser and David Catania, and fellow council members Anita Bonds and Vincent Orange joined 300 attendees dedicated to securing full voting representation for Washington, DC in Congress. Other notables: deputy mayor of DC for health and human services BB Otero, UDC President James Lyons, and DC Vote co-founders Daniel Solomon and Joe Sternlieb.